When Heather first reached out to me for information about a maternity + newborn session collection, she had a lot of questions, but her biggest concerns were about what to wear. Heather has a more casual style but was interested in dressing up for this occasion. It didn't take her long to share her concerns about not being "very fashionable." And to be honest, she sounded a lot like myself! :) So we scheduled an in-person wardrobe consultation for her right away. She came into the studio and tried on a few dresses and also brought in a few pieces of her own favorite clothing. We worked together to create a plan for her maternity session wardrobe for her and her family that we were both excited about! On the day of her session, Heather came to the studio first to have her hair and makeup done by one of our exclusive HMUA artists. Her son had fallen asleep during their 1hr+ drive from Salem, VA, so her husband waited with him while he finished his nap and Heather enjoyed an extra treat of being pampered without distraction! Of course she was so happy to embrace her sweet little man as soon as he woke up and was ready for those sweet after-nap snuggles. :) We quickly hopped over to the field setting, which is just about two miles from the studio, and began the photography portion of their experience! Below are my favorite images from our time together at the field. I love how everything came together to showcase Heather's beautiful family celebrating a fleeting season in their lives while also staying true to her family's personality and style! 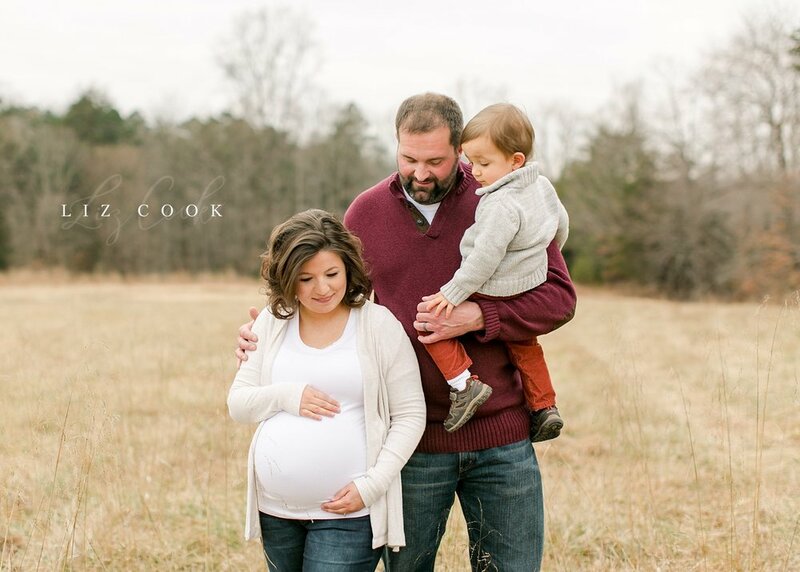 Liz Cook is a maternity, birth and newborn photographer with a studio located in Bedford, Virginia. She loves to photograph emotional and storytelling portraits, the details of parenthood, and fun and easygoing couples in love.